Winter may seem like an odd time to pull on the gardening gloves instead of your woolly ones, but it can make a real difference to your lawn come spring time. Especially if Jon Snow is forecast! Our 5 quick tips can help you turn your winter turf from troublesome to terrific! If you want to be in the best position to get growing for spring, you’ll need to keep an eye on thatch / moss that may be forming a layer above and below your lawn. This can diminish drainage and encourage diseases to take over your turf. How to stop it? A simple scarify should do. Use a spring-tined rake to scarify the surface of your lawn whilst gathering debris such as old grass clippings or any forgotten leaves and discarding them. Spread our Feed, Weed & Moss Killer to kill off moss and weeds whilst feeding your lawn with fertiliser. Then, relax - because it’s just that easy! While your garden may be lying dormant for now, it probably saw a lot of action over the summer which will have compacted the lawns surface, leading to loss of drainage and an increase in weeds and moss. To improve this before introducing your spring / summer showstopper garden to the neighbours, you’ll need to aerate your soil. Aerating is the process of spiking the soil to alleviate the compaction caused by heavy use of the lawn. You’ll need a pitch fork to complete the aeration of your lawn, and also some nice dry crisp winter weather. To aerate your lawn, drive the pitch fork into the soil - 50mm deep for every 100mm whilst rocking it back and forth – this will allow the air to get into the soil and break up the compaction whilst also allowing the free movement of water and nutrients too. This will leave spikes in your lawn, so it may be an idea to top-dress your lawn – but we’ll have more on that later. Just because those grass seeds seem sleepy, it doesn’t mean they’re not hungry! If you think your garden is in hibernation, remember that it still needs to be fed. Our Slow Release Autumn/Winter fertiliser is designed as a balanced feed to protect your garden over the winter months, staggering its growth to protect it so that it produces a delightful and disease-free sward come spring. Believe it or not, walking on your lawn in winter especially when it’s frosty can damage it. Walking on your grass contributes to compaction and can introduce fungal diseases to your fabulous fescues without you realising. So, if you can, keep pets off the lawn and take them to the park and likewise designate a special snowman making spot in a corner to give your garden a little timeout and much needed TLC throughout the colder months. 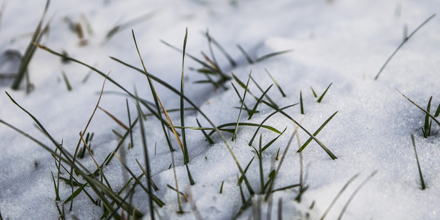 Snow may look pretty when it’s falling, but when its been lying on top of your grass for weeks and then melts – what’s left of your lawn might not be so pretty. Snow creates a layer over your grass that stops it from receiving vital nutrients to maintain and sustain its growth. Without access to these nutrients your grass may be more susceptible to fungal diseases – that’s why we made our Winter Turf Hardener which is a granular fertiliser specially formulated to protect your lawn during winter by decreasing the chance of disease. So, if you want to avoid your garden becoming House Stark in Spring, take note of our 5 quick tips to get your garden winter ready!